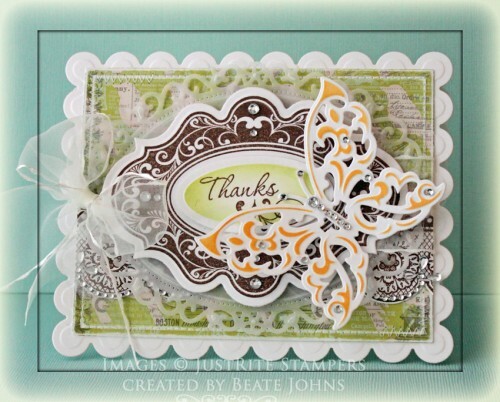 The current JustRite Stampers challenge is to create a card using spring colors and butterflies. I just got new Spellbinders dies in and couldn’t wait to try out the smaller of the two butterfly dies from Wings of Hope. I cut and embossed a piece of Neenah Solar White cardstock and sponged the butterfly with the die still on with Cantaloupe Memento Ink. A frame from JustRite Stampers Kindness was stamped in Rich Cocoa Memento Ink on Solar White cardstock. It was cut and embossed with the largest Label 20 Nestabilities die. Another piece of white cardstock was cut and embossed with the smallest of the Large Petite Oval Nestabilities die and sponged with New Sprout Memento Ink. A sentiment from Kindness was stamped in Rich Cocoa ink on the oval before that was adhered to the stamped frame with dimensionals. The butterfly was adhered to the lower right of the frame. An image from Classic Scallop Border I was stamped in Rich Cocoa ink on white cardstock and cut out. It was stitched to a piece of Pink Paislee London Market Patterned paper that had been cut and embossed with the second smallest Grand Rectangle Nestabilities die and the edges had been sanded. Fancy Waves! Border bling was adhered to the bottom of the scallop before the sentiment and butterfly were adhered to the center of the paper. A piece of vellum was cut and embossed with the largest of the Floral Oval Nestabilities dies and adhered under the sentiment layers with dimensionals. May Arts ribbon was threaded between the Vellum and the label, the label was adhered to the patterned paper with dimensionals and the ribbon was tied into a bow. Everything was adhered to the card base, which was cut and embossed out of Solar White cardstock with a Grand Scallop Rectangle die. Rhinestones from the new Sleek Strips Silver Rhinestones on the butterfly and label finish off the card. I hope you have time to participate in the challenge. You could win JustRite stamps! Have a wonderful weekend! P.S. : Yes, I am hooked on Grand Scalloped Rectangle cards right now and that Floral Oval hasn’t left my desk since I unpacked it. 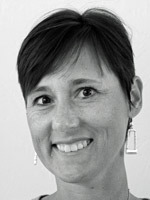 Hi…I am Beate and I am a Spellbindersaholic…..no, I don’t want a 7 step program. I am loving with it! Another gorgeous creation!! I love all of the different layers and the color scheme is fabulous! I just love the cards you make with Spellbinders and Just Rite Stampers. Colors on this one are so pretty…and that butterfly! Oooh-la-la! I’m addicted right along with you! Oh my goodness, that butterfly is gorgeous! Another beautiful creation, Beate. Awesome card! Beautiful butterfly. The brown looks really rich with the other colors. Your card is so gorgeous and elegant! I love the colors and design. The blog candy arrived today. Thank you so much! yummy color combo and love those delicate details. love this beauty, Beate! Your card is a breath of Spring air, Beate. This is gorgeous, I LOVE that butterfly!! Ha ha…..you are such an enabler, and now I find you are an addict as well…lol! Another gorgeous card my friend – have a wonderful day! I have a slight addiction to butterflies (really, they are the perfect symbol for so many things!) and I just LOVE this one! wow this card is very elegant. I love the shapes that you used and the butterfly is gorgeous. LOL, you’re too funny!! Gorgeous card you Spellbinders-aholic you! A lovely card Beate, I love the design it is so elegant. lovely spring card, pretty butterfly, love the bling along the scallop and the vellum oval in the back! Beate, love your card and that butterfly is awesome! Great job! Beate, I love your card. Its ok to be a spellbindersaholic, I’m right there with you!! LOL. Thank You for always making GORGEOUS cards Beate!!!! What a pretty card Beate! Love the vellum floral oval! IF I ever NEEDED a butterfly die (and I DID this week! ), this would be the ONE I have to have — WOW!!! It is simply scrumptious and the other one in the set is nothing to sneeze at!!! WOW!!! A truly GORGEOUS card in every way, Beate!! !